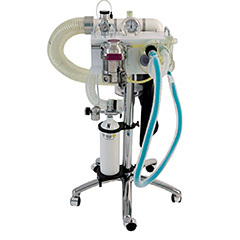 The LANA is a combined anaesthetic machine for large and small animals incorporating a clear carbon dioxide (CO2) soda lime canister with a 4.2 kg capacity, which can be filled and emptied in seconds. The LANA incorporates a 180 degree mechanism, wide bore hose-in-hose assembly with built in breathing valves. All circuits supplied including a separate KAB CO2 Absorber to accommodate small animals. (i) LANA™ absorber for large animals. (ii) KAB™ absorber for small animals. Provides accurately metered oxygen flows between 0-8L/min and incorporates an Oxygen Flush* (Bypass) control which operates at all settings to rapidly inflate the breathing bag when required. *NOTE: When the Oxygen Bypass is operated, the oxygen enters the circuit distal to the vaporizer. 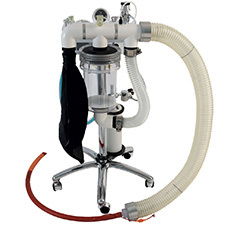 Large Animal LANA™ CO2 Absorber and Hose-in-Hose Breathing Circuit. Rapid filling and emptying of absorbent through large bore opening in top. Rotates through 180° for emptying absorbent. No lifting or dismantling required. Delrin cover plate which can be unscrewed for cleaning. 52mm and 82mm diameter LANA™ ‘Hose-in-Hose’ Breathing Circuit. Large diameter manifold and hoses reduce resistance. Endotracheal tube adapters in different sizes: 18, 20, 25, 30, 35 and 40mm. During pre-filling of breathing circuit, the patient end of the LANA™ Hose-in-Hose assembly is fitted to the ‘Blocker’ on the inside of the base. After use this ‘Blocker’ conveniently stores the LANA™ Hose-in-Hose. Instantaneous removal and reconnection of hoses to drain condensation. Leak proof assembly: Pressure tested to greater than 40cm H2O at 1L/min. Small Animal KAB™ Circular CO2 Absorber (Autoclavable). Powder coated white steel base. Universal ‘F’ Breathing Circuit for small animals c/w 2L breathing bag. Trolley post: polished stainless steel, unique MDI swivel mechanism.